Yesterday The Guardian website had an article on climate change denialists entitled, Here’s what happens when you try to replicate climate contrarian papers. Those who reject the 97% expert consensus on human-caused global warming often evoke Galileo as an example of when the scientific minority overturned the majority view. In reality, climate contrarians have almost nothing in common with Galileo, whose conclusions were based on empirical scientific evidence, supported by many scientific contemporaries, and persecuted by the religious-political establishment. Nevertheless, there’s a slim chance that the 2–3% minority is correct and the 97% climate consensus is wrong. Now it is true that climate change denialists, like denialists in many other areas of scientific consensus, commonly use what is now known as the Galileo Gambit. This involves claiming in some way that Galileo was persecuted for his theories, although he was proved right in the long run. Implying that the denialist will also be proved right in the long run and hailed as another Galileo. Bob Dylan provided the perfect answer to the Galileo Gambit in his song Bob Dylan’s 115th Dream way back in 1965. I would not object to the author’s comments on the contrarians misuse of the name of Galileo if her his comment had stopped at, climate contrarians have almost nothing in common with Galileo, however she he goes on to spoil it with what follows. Although Galileo’s views on heliocentrism, and that is what stands to discussion here, had their origins in empirical observations made with the telescope he unfortunately did not stop there and they were not supported by a consensus of his contemporaries by any means. In fact at the time of Galileo’s trial by the Catholic Church the majority of astronomers qualified to pass judgement on the subject almost certainly rejected heliocentricity, most of them on good scientific grounds. In his Dialogo, the book that caused his downfall, Galileo knew very well that he did not have the necessary empirical facts to back up the heliocentric hypothesis and so he resorted to polemic and rhetoric and brought as his pièce de résistance, his theory of the tides, which was fatally flawed and contradicted by the empirical evidence even before it hit the printed page. Although it became largely accepted by the experts by around 1670, the necessary empirical evidence to substantiate heliocentricity didn’t emerge until the eighteenth and in the case of stellar parallax the nineteenth centuries. I have written about this historical misrepresentation of Galileo’s position on various occasions and I don’t intend to repeat myself in this post. However anybody who is interested can read some of my thoughts in the post collected under the heading, The Transition to Heliocentricity: The Rough Guides. I also strongly recommend Christopher M. Graney’s recently published Setting Aside All Authority: Giovanni Battista Riccioli and the Science against Copernicus in the Age of Galileo, my review of which should, hopefully, appear here in the not to distant future. Addendum: Seb Falk has pointed out that Dana Nuccitelli is a he not a she and I have made the necessary corrections to the text. I apologise unreservedly to Mr Nuccitelli for this error. h/t to Seb Falk (@Seb_Falk) for drawing my attention to this latest misstatement of Galileo’s scientific situation. I find your use of the term denialists offensive. Suggesting we climate sceptics have anything in common with antisemitism (whether intentional or not) is abhorrent. I however note a similar issue you did. Many times I have to correct other sceptics on the Galileo issue. Most people still buy into the simple version of the story, ignoring the fine details that reveal the truth. However you feel about it, you do have something in common with Holocaust deniers. You are a tiny minority opposed by an overwhelming consensus. To pretend that the analogy refers to any other supposed similarity is silly. And to be offended by this valid analogy doubly so. They have something else in common with Holocaust deniers: failure to grasp that the outcome is millions of deaths. Except in the case of climate change, we’re talking _billions_ of deaths. Some day we may understand the psychology of this, which will hopefully lead to a cure. Calling climate change deniers what they are is appropriate, and it is offensive for you to say that doing so carries the taint of anti-Semitism. There is an ironic parallel between your bogus attempt to invoke anti-Semitism here, and the bogus attempt to invoke the initial rejection of heliocentricity in the Galilean gambit. If we’re wrong that CO2 emission caused by human activity in turn causes climate change, then replacing fossil fuels with nuclear and renewable energy would have been unnecessary. Even so, all of that spending will have produced profits on investments, large numbers of well-paying jobs, and independence from oil produced by unstable and unsavory regimes halfway around the globe. If you’re wrong that CO2 emissions are innocuous, then we will be on track for a near-extinction event for our species. Since you’re opposed to making “unnecessary” efforts, next time you smell smoke, don’t bother to get up to see if your house is on fire, OK? So what are your thoughts on the use of ‘HIV/AIDS denier’ (in use since the end of the 1980s in a scientific context)? Is it antisemitic, or just a good use of the word ‘denier’? The word “denier” occurs in the phrase “holocaust denier”, so any use of “denier” is inherently anti-semitic? Really? Do we know when and why Galileo became a heliocentrarian? We know from his letter to Kepler in 1597 that he was already a Copernican, nearly a decade before he pointed a telescope anywhere. I seem to recall Heilbron suggesting that the theory of tides (perhaps due really to Sarpi, at least according to Ron Naylor) was the convincing evidence for Galileo. I don’t have Heilbron’s bio handy, so my memory may deceive me. But at least Kepler thought that Galileo might be trying to explain the tides via the motion of the earth (like Kepler’s friend Herwart von Hohenburg). The theory of tides is more likely a result, not a cause, of Galileo’s Heliocentralism. He argued that the tides were caused by the difference in linear velocity on the night side of the earth (where the velocity caused by the rotation of the earth is added to the orbital velocity) an the velocity on the day side – where one must be subtracted from the other. He believed that this would cause the oceans to slosh – hence the tides. If true this would provide physical evidence of the Earth orbiting the Sun. Unfortunately it would also result in only one tide per day – which minor problem Galileo overcame with a bit of hand waving. He was adamant that the moon had nothing to do with the tides. My guess is that he was attracted by the simplicity and elegance of the Copernican model, Which I think is perfectly reasonable. To my mind Galileo’s real claim to fame is the work he did in mechanics, concluding that acceleration due to gravity was uniform, deriving the equation s = u*t+ 1/2*a*t*t and proving that the path followed by a projectile in the absence of wind resistance would be a parabola. All this without using algebra (which had just arrived in Europe) let alone calculus (which was waiting for Leibniz and Newton to be born). 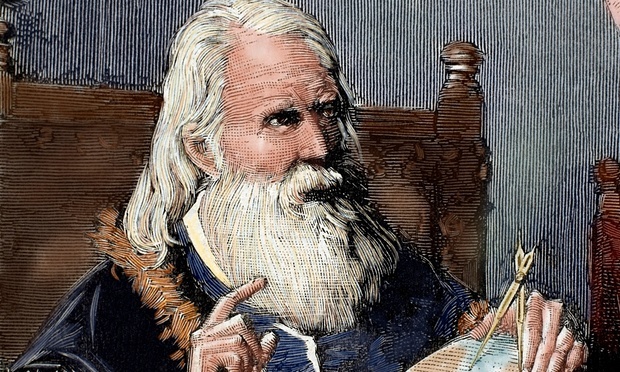 Both Heilbron (author of a Galileo bio, and one of the most respected science historians) and Ron Naylor (who has made a special study of this theory), have proposed that the theory of tides may have convinced Galileo of the truth of the heliocentric hypothesis. The evidence is suggestive if not conclusive. One needs to be careful not to read back our present-day viewpoint onto Galileo. For us, the theory was clearly wrong, Galileo should have realized it, and other evidence (for heliocentricity) looks better in hindsight. That doesn’t mean it looked that way to Galileo. Note also that the question is what initially turned Galileo into a Copernican — once he subscribed to that view, he naturally found other evidence. Galileo suggested a halfway reasonable, though incorrect, fix for the 1-tide-per-day problem: in modern lingo, resonance. In fact, before Newton (and curiously the vortex theorists) none of the extant tidal theories explained the two tides per day. The Sarpi/Galileo theory however also didn’t explain the correlation of the tides with the phases of the moon; at least the lunar theory (Kepler and others) didn’t suffer from that defect. The modern consensus is indeed that Galileo’s mechanics is his chief claim to fame (along with his telescopic observations), but as W.R.J. Shea pointed out, Galileo himself may have regarded the tidal theory as a greater achievement. The 1/2 at^2 result follows directly from the mean-speed theorem of the Oxford calculators (14th century), readily proved without any algebra, let alone calculus, by a simple geometric argument (discovered soon after by Oresme). Disentangling exactly where and how far Galileo forged ahead of his predecessors, and just what may have been independent rediscovery, is a rather non-trivial task. Something most popular histories of science gloss over, and something Weinberg goes into in some detail in To Explain the World. I agree about Galileo’s mechanics being his great achievement (also his work on scaling and the tensile strength of materials in the Discoursi is really super-ingenious and sort of blew me away when I read it and followed the various arguments) but I don’t think it’s quite true that Galileo concluded that acceleration due to gravity was uniform — he didn’t really believe in gravity as we understand it (as attractive “force” between material objects); he just verified that uniform acceleration held in experiments and went from there. Independently at about the same time Isaac Beeckman did derive uniform acceleration under constant force from first principles: inertia (which for him could be rectilinear or circular) maintains a constant speed in a constant direction and the force of gravity (which Beeckman had an exotic corpuscular theory for and thought of as occurring in tiny discreet increments) provided a constant addition of new motion which would then be maintained through inertia. If the force adding to the motion was uniform, then so would be acceleration. From that idea, with Descartes’ help with the maths, Beeckman derived the law of fall. Harriot and his group also derived it independently at about the same time or a few years earlier, but I haven’t yet read up on how he/they did it. It’s very interesting though that the law of fall was arrived at independently by three separate groups of researchers in different parts of Europe within (probably) 20 years of each other and (at least in Galileo and Beeckman’s cases) using completely different approaches. Clearly it was an idea whose time had come. There is a new book on Harriot out (author’s name escapes me) that looks like it will discuss his mechanics in detail. But it’s a bit expensive so I didn’t buy it when I found it. I only read the introduction in which it’s claimed he and his assistants had the law of fall, but very little at how they arrived at it. Yes; and in fact while I said that Beeckman and Galileo used different approaches, I mean conceptually in terms of physics. Mathematically, Descartes’ graphical representation of the problem which was drawn into Beeckman’s journal looks a lot like Oresme’s famous graph, just like Galileo’s did. The only thing that is new in the math was Descartes’ use of infinitesimal analysis to analyze a continuous uniform force. So definitely common sources even if the approaches were different. The straight forward answer is that nobody knows. Sadly, this is the standard of science reporting in the Guardian these days. It is possible that the authors’ text has been changed by the sub-editors without consultation. Athene Donald complained of a similar problem with them adding a sentence to her article that she had not written and never would write (see her 28/7/2015 posting on Occam’s Typewriter). It was The Observer (the Sunday paper in the Guardian stable) that she was complaining about but, without Athene having her own widely-read blog, we would never have known that the words were not hers. Thanks for alerting me to this book – my copy is now winging its way from Amazon’s warehouse as we speak. And I notice, on reading the first pages via preview, that a certain t. Christy gets a mention in the acknowledgements – nice work! I have read Prof. Graney’s book and it’s outstanding. He’s done a lot of important work (IMHO) showing (a) that there were rational, scientific reasons for rejecting heliocentrism in the 17th Century, and (b) that ecclesial authorities were familiar with them and may well have had them in mind when they censured Galileo and Copernicus’ work. He’s also a terrific teacher, explaining some rather arcane scientific concepts in a way that is readily understandable to ordinary readers like me. Before reading his book I never fully understood the Coreolis effect; I never understood Focault’s Pendulum, or exactly why it demonstrates the rotation of the earth; but I do now. More to the point, I understand much better than I did before why it was reasonable of 17th C. philosophers to expect that something like these phenomena should have been observed by them if heliocentrism was true. It’s a fascinating book — I’m really looking forward to Thony’s review. I’d like to ask a question because I’m at a loss as to the real value of Galileo. In physics and astronomy I’ve always been told that Galileo was one of the greatest scientists of all time, practically the founder of modern science. Yet I feel that to historians of science he’s a minor figure on the same level as his contemporaries. My question is: are all the physicists wrong in considering Galileo a key figure of physics like Newton and Einstein? The standard all pervasive myth is that Galileo singlehandedly established heliocentricity in his courageous stand against the bigoted prejudice of the Catholic Church. This myth was created in the 19th century and it is this that historians of science have been dismantling over the last few decades, although it lives on in popular science writing. However Galileo did make a very major contribution to the history of mechanics in the seventeenth century with his Discorsi and it is for this that he should be honoured and not the Dialogo. If you wish you can read my somewhat over the top criticism of the Galileo hagiography, Extracting the stopper, here. I’ve read your article and I think I now get it. It’s like claiming Planck invented quantum mechanics leaving aside the contributions of Einstein, Bohr, Heisenberg, Schrödinger, Fermi, Dirac, etc. Very clear explanation of Galileo’s merits (and demerits). Pity they don’t teach that in college physics. Interesting example considering that several historians believe Planck did not introduce the quantum into physics. A key question regarding the scientific value of Galileo Galilei are for me the claimed or true experiments. I remember there have been doubts on the reality of these reports. Also some measurement values he reported are too good to be believed. Given the visible fact that Galilei twisted the moon drawings for pedogogical reasons (or to make them more impressive) so there is no genuine value left in the sense of a lunar map, he could have embellished or purified these results easily and non-controllable. What do you historians know about this today? An Experiment in the History of Science, Thomas B. Settle, Science 133 1961 p.19-23. A Test of an “Imaginary” Experiment of Galileo’s, James MacLachlan, Isis 64(3) Sept. 1973 p.374-379. In 1961 Thomas Settle refuted Koyré’ s denial of the precision that Galileo’s water clock could achieve. Despite Koyré’s claims … Settle was able to use apparatus like Galileo described to achieve results with precisions similar to those Galileo reported. In 1976 I repeated a number of Galileo’s experiments with pendulums to test claims he had made about them. I was able to demonstrate that some of his claims were unsupportable and others possible. In particular, I found that one of his claims could be substantiated if the suspended metal balls were about 2 centimeters in diameter but not if they were much larger. In these documents precise empirical data are given numerically, comparisons are made with calculated values derived from theory, a source of discrepancy from still another expected result is noted, a new experiment is designed to eliminate this, and further empirical data are recorded. The last-named data, although proving to be beyond Galileo’s powers of mathematical analysis at the time, when subjected to modern analysis turn out to be remarkably precise.